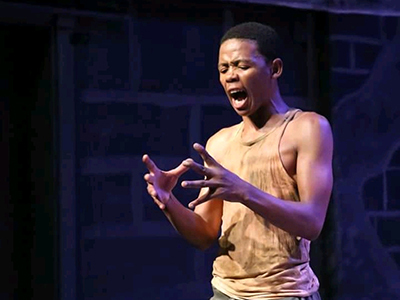 In an extraordinary moment, innovative young residents of Sharpeville, descendants of the township which changed the course of history in South Africa, have brought an award-winning piece of theatre to the National Arts Festival fringe. In Sharpeville the apartheid police massacred 69 anti-apartheid protestors on March 21, 1969, and injured a further 180 people. That was 49 years ago. This week Dikakapa (giants) produced by Sharpeville’s Generation of Stars started playing at the NGK hall in Grahamstown. Dikakapa will plunge audiences into the deepest world of South Africa, where past and future share sacred dust and fresh dirt. The theatre company, represented by eight trained actors, comes fresh off a year of accolades – most promising production by the Gauteng Ishashalazi theatre festival 2017, a 2017 Standard Bank Ovation Award at National Arts Festival, topped off with a hard-fought win at the 2017 Market Theatre Foundation’s 25th Zwakala Festival which was held under the theme “from community to artistic excellence”. Dikakapa follows in the new-theatre footprint of the previous Zwakala winner, the Market Theatre’s production of Tau, which explored male initiation and gay sexuality, which The Critter reported went on to be garlanded with three Naledi awards, winning Best Ensemble, Best Original Choreography, and Best Lighting Design. Dikakapa’s artistic electricity explodes out of a life lived hard and true. Significantly these are young men and women actors barely out of their teens, some as young as 16, all putting it all out there, under the guidance of Generation of Stars scriptwriters Isaac E. Sithole and Teboho P. Serapelo, who also perform, and mentored by Kgafela Oa Makgokgodi and Mpho Molepo. The cast are Mojabeng Rasenyalo, Mbali Beula, Tumelo Mdabuli, Mdengase Govuzela, Kholisiwe Dlamini. Dikakapa is directed by Lebeko J. Nketu. Sithole says that in the spirit of true grit and humility, the performers have produced a story which comes out of the real-life morass of unemployment, drug-abuse and general abandonment and stasis in Sharpeville, harsh features with characterise life in too many of SA’s townships. Drawing on Sharpeville’s history, the story was created in an abandoned old Letaba power station hostel only a few minutes away from the graves of the Sharpeville victims in Phelindaba (“The issue is done”). It centres on the life paths of two struggle heroes, one of whom, the antagonist, Sipho Moleko, has chosen a greasy path to political ascendancy arriving at a place called betrayal, yet is still hailed as a “hero”. The protagonist in Dikakapa, Tebogo Mokoene, draws on the life of Sharpeville’s PAC stalwart Nyakane Tsolo, who led the peaceful protest in Sharpeville, was detained and tortured by the security police, and went into exile where he fought for the PAC until his death in SA in 2001. Dikakapa is a story emblematic of the corruption of the original ideal of Sharpeville’s democrats who lie at rest so close to where the work was created. He says the work has evolved with the inclusion of the antagonist Mokoena and some fine tuning of the content to give more theatrical power and historical accuracy. “It’s what we want to see,” he said. In general, he says: “There was so much bloodshed to get us to this point, and it should count for something. Corruption must eradicated. We don’t want it. In our show we tell of how it has been under this leadership, after so many tears and so much blood, people are still living on their knees. This comment hints at the backstory to Dikakapa. At home in the old mining hostel, Generation of Stars has in its five years inspired the youth to start a boxing club and weight-lifting gym in the hostel. About 40 youths are involved in the Generation of Stars arts project. Sithole, 28, grew up in the arts in Sharpeville, and then was with the Giant Puppet Company and performed in works supported by the Gauteng government and French Institute of SA. This profile is sponsored by the Market Theatre Foundation.